Edited by Alexander, 14 January 2010 - 10:50 AM. A pdf in 150 dpi is good enough for these. The resolution is small enough to keep the file size down and good enough to read and have clear lines on the diagrams. 150 dpi is too small to see the fractions in this book. I have it set at 300 dpi and the total size is 20mb. I think thats pretty good for a 300 page book. That is pretty good compression rate you squeezed out. I noticed you scan with a B&W text scan, I typically use a B&W document scan, and clean up with photochop, a little more time consuming but is an exact facsimile of the original, that preserves the lines and fractions. Thank you for sharing as this is an invaluable resource that many here in the forum can use. It would be a nightmare to clean up 300 pages in photoshop...anyway you're welcome and enjoy! Edited by amateursarto, 16 January 2010 - 10:27 AM. You're welcome! I will scan the other two books in the near future. I'll post them here when they're ready. Also, everyone let me know if you find any missing pages or pages that have unreadable words/numbers and I will do my best to fix them. Edited by scissorhand, 05 February 2010 - 07:04 PM. I am trying to buy those books, havent found a 1949 edition. Alexander, excellent job done with Photoshop couldn't do it better. With those clean production I can already imagine how clean your tailoring will be. I have to give Sator right, the book are completely overvalued. It’s nice to have it but it is not a must. The German MM Books from 1950 14. edition and onwards are already ages better than MTOC. But as a collection I will buy them, you can see the good old time in it. Edited by Der Zuschneider, 05 February 2010 - 10:22 AM. The 1949 MTOC is to some degree a collage of several other books. 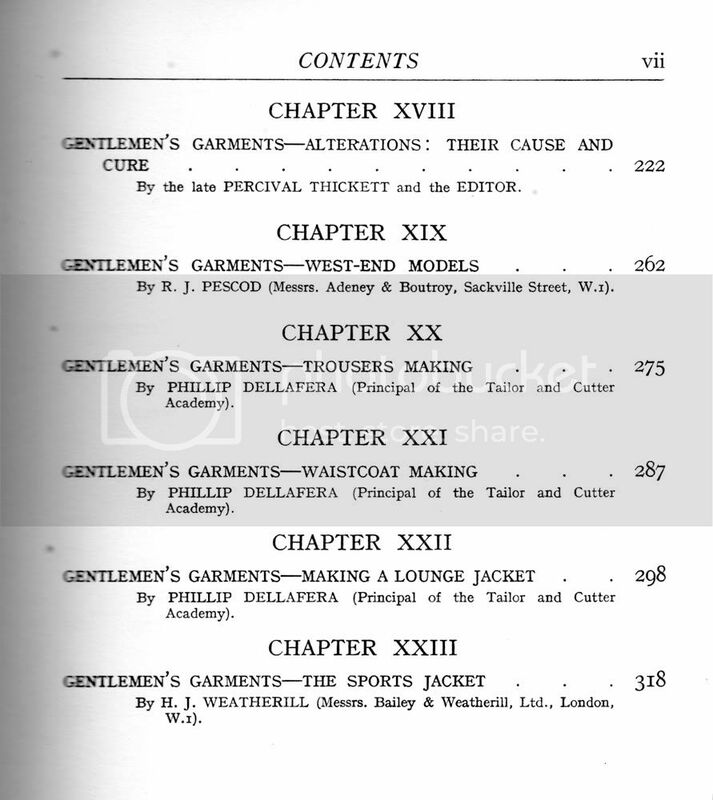 These include the Dellafera edition of The Art of Garment Making, Whife's A First Course in Gentlemen's Garment Cutting, and the Percival Thickett era edition of the book on fitting. 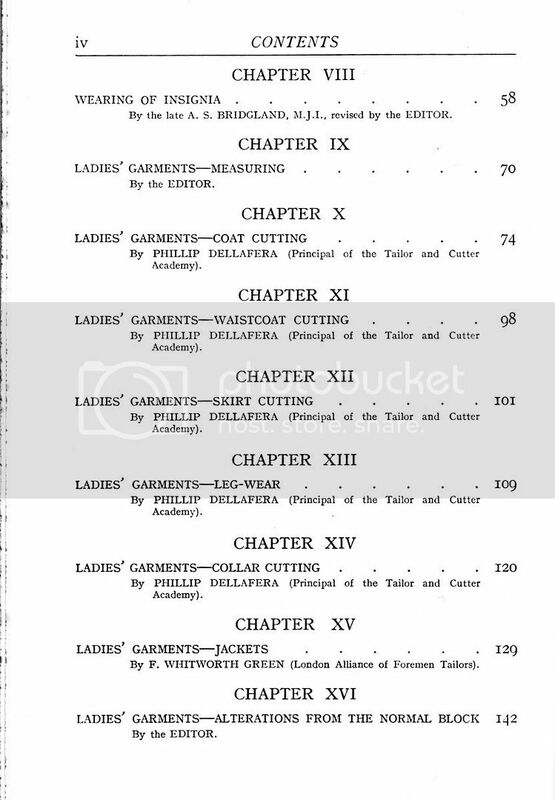 There are a few ladies' drafts but very little indeed in comparison to Dellafera's A First Course in Ladies' Garment Cutting. 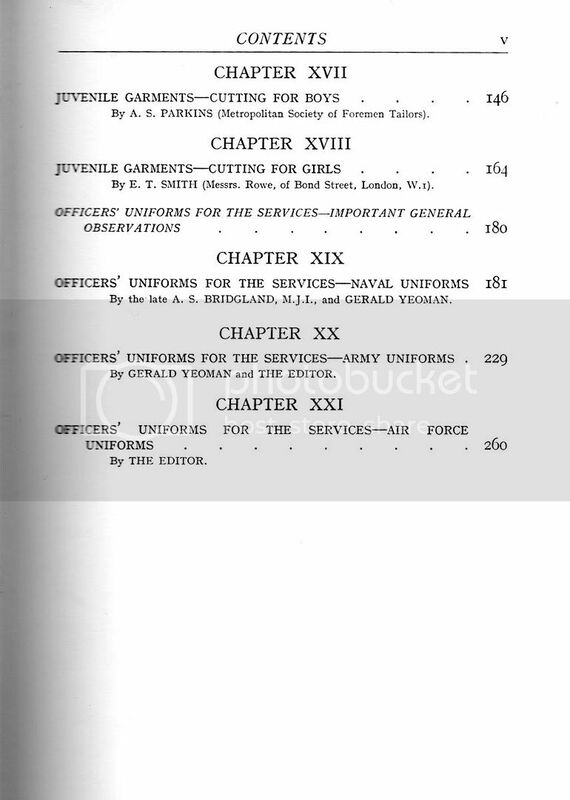 Then there are miscellaneous bits and pieces about military uniforms of the period, dress etiquette (how to wear medals etc), pattern grading, shirt cutting, and running a business (book keeping, window dressing etc). I suspect that some of you are under the impression that you are getting three massive tomes dedicated to cutting and tailoring, but little could be further from the truth. 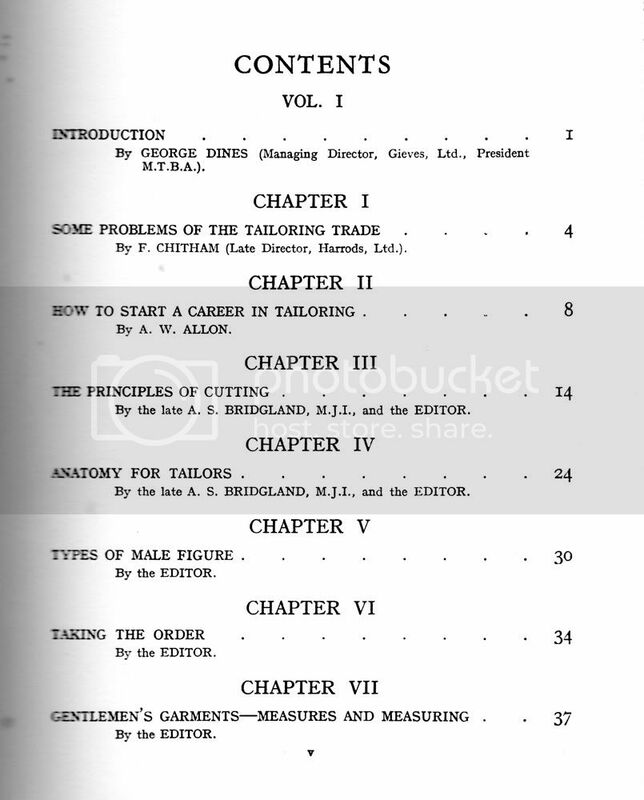 Those of you interested in gentlemen's cutting will find little essential information beyond the first volume. 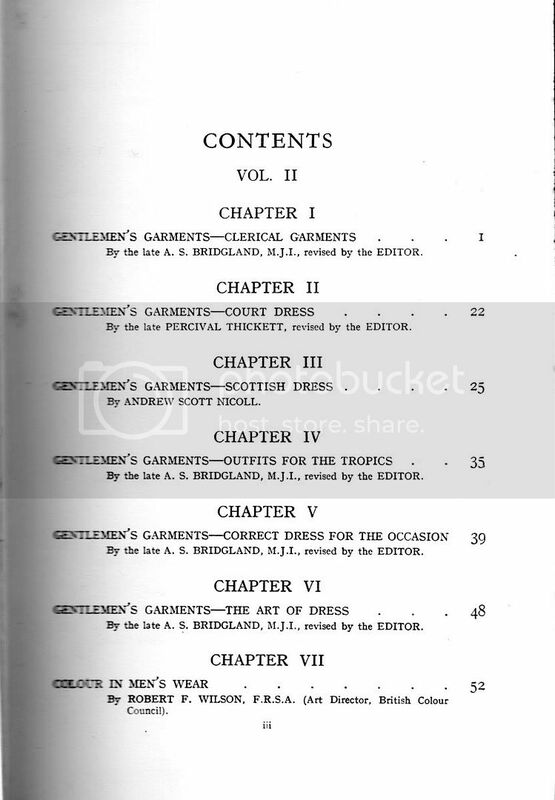 Those interested in ladies' cutting will find parts of volume II useful. The rest consists of miscellaneous odds and ends, which are interesting but not essential. Some of it is too dated to be of any use other than to a costumer. The individual books from which contents are taken to form the MTOC also come in more updated editions. 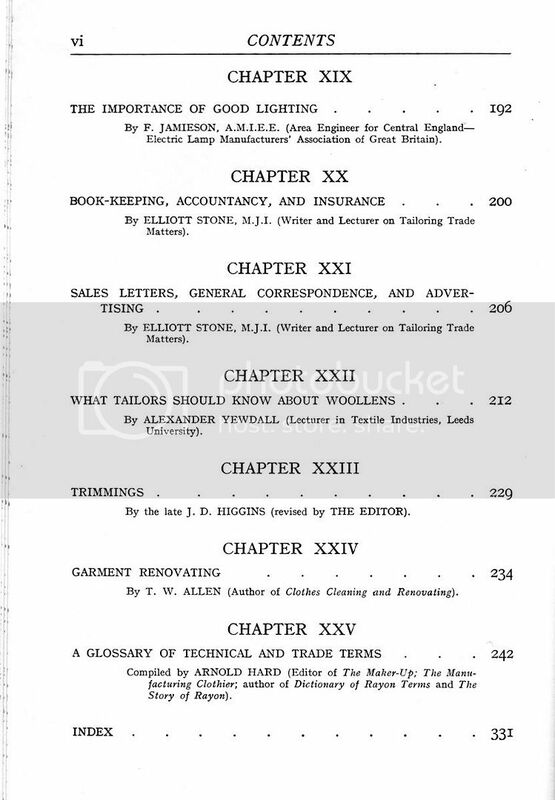 Thickett inherited the garment fitting book from W.D.F Vincent, under whom he worked to produce earlier editions. Dellafera takes on the fitting book after Thickett. Inclusion of the Vincent-Thickett-Dellafera book on fitting in the MTOC means that Reuben Sytner's book on fitting, which is arguably more comprehensive, is omitted altogether (it had to be one or the other, and not both in the MTOC). 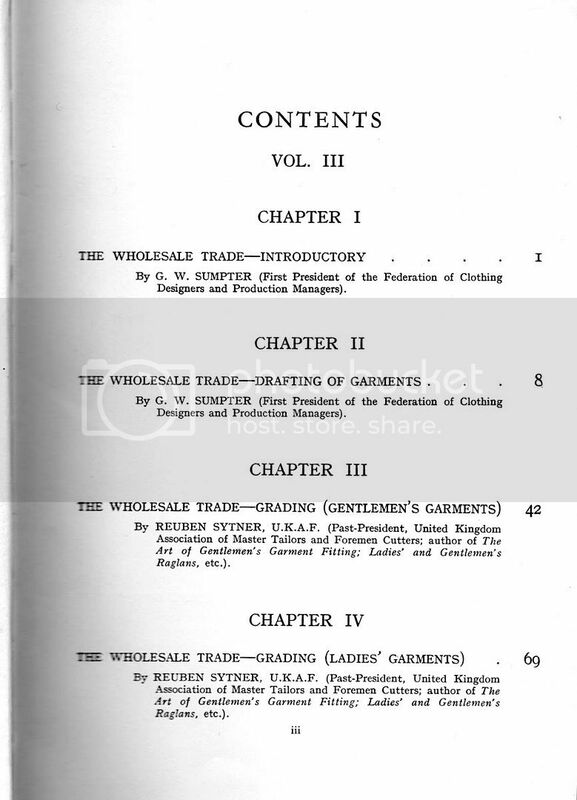 After Dellafera's death, Whife also starts to add his ideas to The Art of Garment Making. After a while, they stopped updating the MTOC. 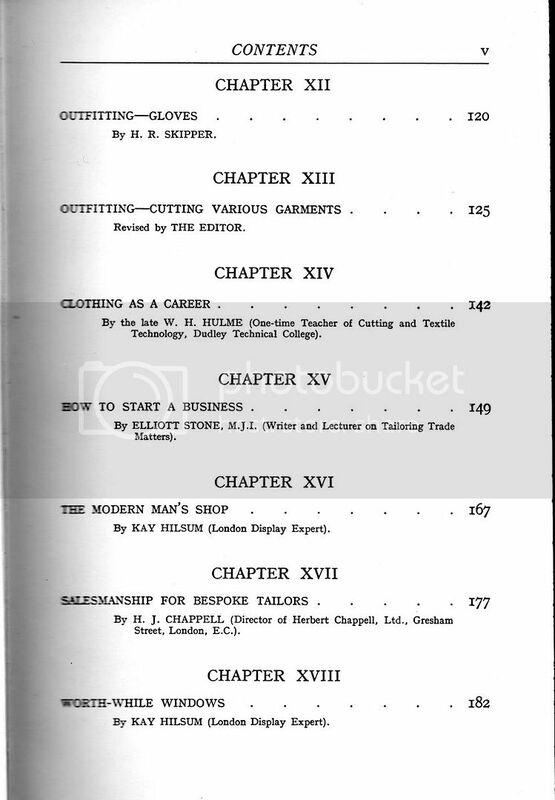 In 1960s edition of The Tailor & Cutter Journal, they don't even advertise the MTOC, but they do continue to advertise these individual books. I suspect the MTOC was too expensive to print compared to the amount of buyer interest. 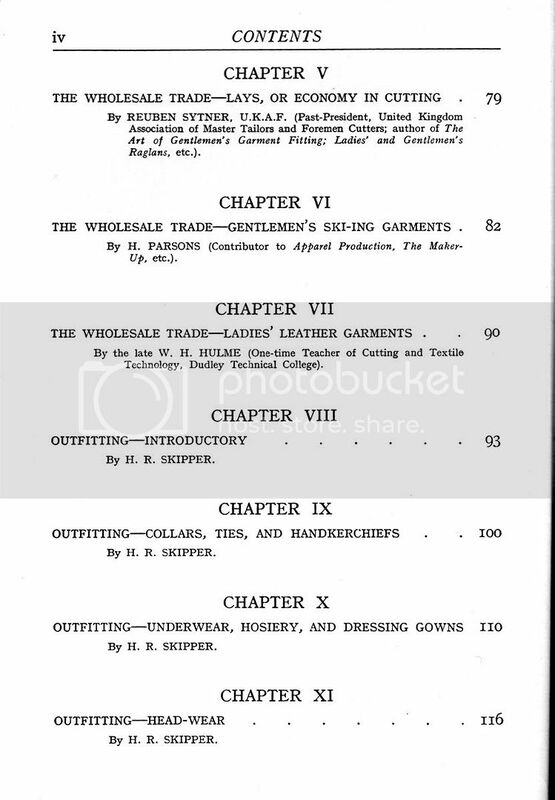 The end result is that if you want Whife's most recent ideas on cutting and tailoring you have to turn to the individual books that get updated beyond MTOC. In that sense, the MTOC is left to become outdated causing it to become a bit of a white elephant - a magnificent one, but a white elephant nonetheless. If you took the gentlemen's cutting material out of MTOC and made it up into a single volume, it would be significantly less than one Rundschau cutting book. I actually like the books only standing on my shelf as a collector. For a modern Tailor the MTOC is nothing. I saw in the scanned pdf of volume 1 and I saw simply nothing! You can look at the books and get a feeling of the old times only. In order for the MTOC like an MM Book it would need to be 10 Volumes of MTOC. Some crazy man in eBay sells the MTOC for 1500$, who ever pays that amount of money is sick or a millionaire! 300$ I can understand, 600$ is already crazy enough for an collector and superb condition. Sator sees it the same way, cause he has a clue. Collecting is nice, but for a modern suit you need to use other recourses not MTOC. Nope, you need to download it as a free user, you dont need to have an RS Account. I understand what you guys are saying and I agree. There really is no book that can be considered the "holy grail" of bespoke tailoring. As with any learned skill, you can't know everything about the said skill simply by reading a number of books. Books are only a supplement to your learning and they aren't even necessary provided you have a good teacher. I would also like to help break up the blandishments surrounding these books by posting them here so people can see the contents before they decide to spend $600+ on them. I don't want to make it sound like the books aren't any good, they are pretty neat and definitely worth reading. Sator, perhaps you should change the wording in the description for MTOC? 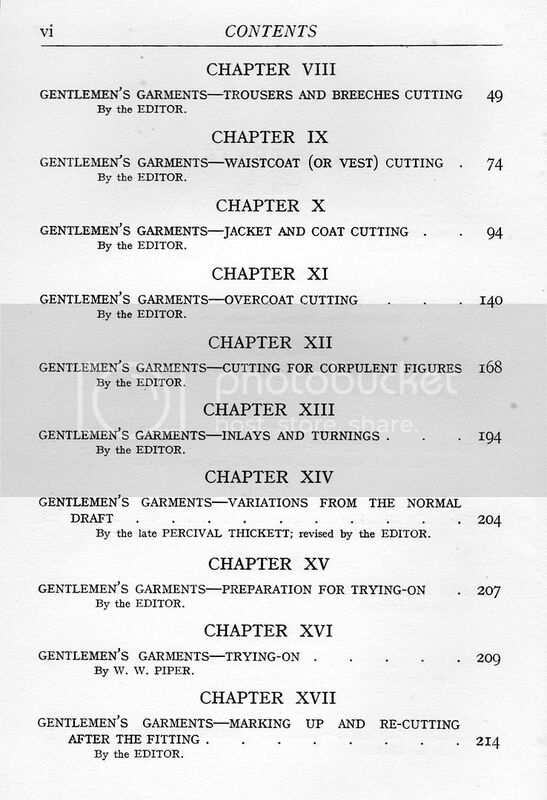 "Arguably the most important textbook on cutting and tailoring published during the 20th century." Maybe its a bit too much flattery? Anyway, some people have asked for the second book, so I will be posting it here very soon. note: This file is bigger than the first file. I wanted the resolution to be larger and I processed the images differently so the microscopic fractions are visible. Edited by Alexander, 04 March 2010 - 08:52 AM. Yes, you are right. I am responsible in part for the inflationary prices seen on the MTOC. The MTOC is a nice decoration to have rather than some sort of Holy Grail book. It's strength is the range of topics covered rather than the quality of information in there, which can be a bit superficial. That is, it's more flash than substance. That's true. It gives generalities of what can be done and how you might go about it, which is great for beginners. Once you know that basic knowledge in your head who needs the books, that is, if you use the knowledge enough to remember it. The MTOC is a nice decoration to have rather than some sort of Holy Grail book. - Very nice said by Sator. If people think they need this decoration they can buy it. To many people are interested in Tailoring now maybe that's way the books became expensive. Still good condition books for decoration are seldom. But people who don't have Rundschau or Mueller Muenchen, what else can they read... in all those books are pieces of knowledge.